With just two months of 2013 left it's fair to say that many boxing fans are already thinking about the end of year awards. Of course that's great for them and we're not here to criticise but we'd just like them to sit still for a minute and look towards the near future. The past year has been fantastic. We've certainly been raving about wars from through out the year and giving the great fights the props they deserve. However this year looks like it won't go out with a whimper in fact it'll go out with massive explosions, fireworks and we dare say a touch of unbridled violence. The first blockbuster card between now and new year looks like the sort of card that could have been a HBO PPV. The show not only has three former world champions in action with Takahiro Ao (24-3-1, 11) fighting Edgar Alejandro Lomeli (14-3-2, 8), Jorge Linares (34-3, 22) fighting Francisco Contreras (21-3, 16) and Roman Gonzalez (36-0, 30) fighting Oscar Blanquet (32-6-1, 23) but also a world title fight. The other title fight sees Bantamweight champion Shinsuke Yamanaka (19-0-2, 14) facing Mexican Alberto Guevara (18-1, 6) in a WBC title bout. A world title bout, three former world champions and a world level challenger. Great card no two ways about it, although it was better when Linares was lined up to fight Richar Abril in a second world title fight. Women's boxing may not be a huge draw internationally but it's fair to say that some bouts do draw that extra bit of interest. One such bout headlines a mid November card in Japan. Unbeaten boxer-puncher Naoka Fujioka (10-0, 6) makes her move from Minimumweight all the way up to Super Flyweight as she takes on the fearsome and hard punching Naoka Yamaguchi (22-3-3, 18). This fight, for the WBA Super Flyweight title, is one that has widely gotten fans talking and promises to be nothing less than explosive. When you consider that the undercard here has Taiki Eto (11-2, 8) and Shingo Eto (11-2-1, 7), the brothers of Koki Eto, you can safely say that that's going to be 3 action fights. Bob Arum takes the Manny Pacquiao show over to Macau as the Filipino icon looks to reinvigorate his professional career in a massive card of action. Not only do we get a potential fight of the year between Pacquiao (54-5-2, 38) and Brandon Rios (31-1-1, 23) but we actually get quite a stacked card. In the other notable contests we get an IBF Featherweight title fight as Evgeny Gradovich (17-0, 8) rematches former champion Billy Dib (36-2, 21), a major Heavyweight clash as unbeaten Heavyweight Andy Ruiz Jr (20-0, 14) takes on Tor Hamer (21-2, 14) and bouts involving IK Yang (13-0-0-1, 9), Zou Shiming (2-0), Rex Tso (10-0, 6) and local attraction Kuok Kun Ng (1-0). If you have a chance to get to Macau for this one you really should take the chance. If you can't then make sure you tune in for the action on Top Rank TV. Just over 2 weeks from the female super fight between Yamaguchi and Fujioka we get another card with great female action. The headliner here sees Ayaka Miyao (15-5-1, 1), the WBA Atomweight champion, defending against Filipino challenger Gretchen Abaniel (13-4, 4) in a brilliant match up that should see both women boxing more than brawling. In the co-feature we have Kayoko Ebata (7-4, 4) fighting Mexican visitor Nancy Franco (11-5-2, 4) in a battle for the IBF female Minimumweight title. Although the other bout is better this isn't a weak "back up" contest. Even the Philippines has a super card lined up between now and Christmas as ALA Promotions put on a world title double header. Held at the 16,500 seat Araneta Coliseum the main event will see unbeaten men colliding as Filipino Merlito Sabillo (23-0, 12) defends his WBO Minimumweight title against Carlos Buitrago (27-0-0-1, 16). This will be supported by Donnie Nietes (31-1-4, 17) defending his WBO Light Flyweight title against Sammy Gutierrez (33-9-2, 23). Kameda Promotions have been criticised in the past for poor cards though it appears that they've listened to those comments and it appears that they are giving fans an early Christmas present. The main event here sees Daiki Kameda (29-3, 18) attempting to unify his IBF Super Flyweight title with the WBA title currently held by Liborio Solis (15-3-1, 7). This would typically have been it for a Kameda card, this however is only the tip of the ice berg. Also on the card is a second Kameda as Tomoki Kameda (28-0, 18) defends his WBO Bantamweight title against Immanuel Naidjala (17-0-1, 11). Again in the past this alone would have been enough to have headlined a Kameda show by it's self. Amazingly we get a third world title bout on this show as IBF Minimumweight champion Katsunari Takayama (26-5-0-1, 10) defends his title against Filipino Vergilio Silvano (17-2-1, 10). This might not just be one of the best Kameda cards but one of the best cards of 2013. If Kameda think they can claim the "card of the year" then it's fair to say others are going to try and give them a really good run for their money. Despite this show only having one world title bout it may well be one of the best of the year as WBC Flyweight champion Akira Yaegashi (18-3, 9) fights Edgar Sosa (49-7, 29). If Sosa can upset Yaegashi we may also have seen the 2013 Fighter of the Year. Below the world title fight we get two OPBF title bouts as Naoya Inoue (4-0, 3) takes on Jerson Mancio (18-3-3, 9) for the Light Flyweight title and Hiroki Shiino (10-2, 9) attempts to defend his Bantamweight title against Ryosuke Iwasa (15-1, 9). If Inoue wins he's a shoe in for prospect of the year. 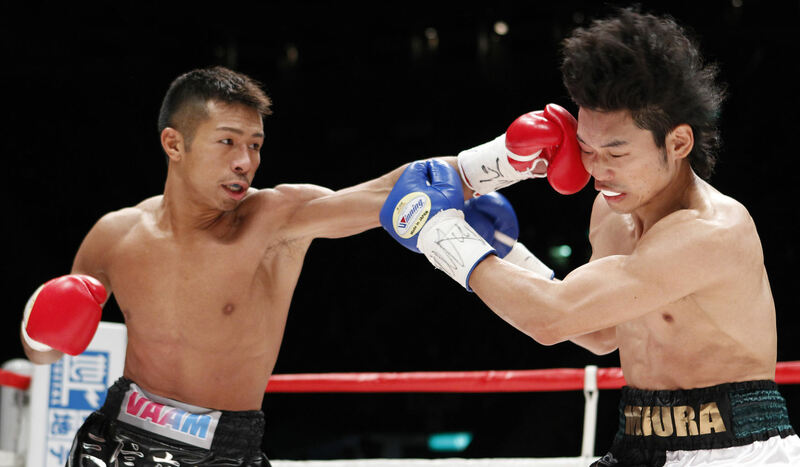 The rest of the card will feature Ryota Murata (1-0, 1) and the debut of Takuma Inoue (0-0). In theory we could have the card of the year, fight of the year, fighter of the year and prospect of the year all on the same card. Whilst most of the other shows on this list will come before Christmas we also get a late Christmas present. New years eve boxing in Japan is nothing new though using it effectively to build up a major rematch might be. This card, the final one of 2013, will feature two world title bouts with both of them taking place in the Super Featherweight division. The lesser of the two bouts here sees the always exciting Takashi Miura (26-2-2, 19) defending his WBC title against Dante Jordan (24-3, 20) in what should be a very explosive and very watchable encounter. In the other world title bout Takashi Uchiyama (20-0-1, 17), arguably the biggest puncher pound-for-pound on the planet, takes on domestic rival Daiki Kaneko (19-2-3, 12) in a WBA title defense. We expect that if Miura and Uchiyama both win we will get a long awaited rematch between the two Takashi's in what should be one of 2014's most demanded match ups. As well as the cards we've already mentioned their is a strong rumour that a second card will be taking place on December 31st as Kazuto Ioka (13-0, 9) and Ryo Miyazaki (20-0-3, 11) return to action. Details are scarce but if this takes place as expected then we'd likely have at least one more world title fight. With this site being pretty successful so far we've decided to open up about our own views and start what could be considered effectively an editorial style opinion column dubbed "Thinking Out East" (T.O.E). T.O.E is just a collection of our thoughts, rambles and general things related to boxing in the East.